CASEY CEP is a writer from the Eastern Shore of Maryland. After graduating from Harvard with a degree in English, she earned an M.Phil in theology at Oxford as a Rhodes Scholar. Her work has appeared in The New Yorker, The New York Times, and The New Republic, among other publications. This is her first book. "A triumph on every level. One of the losses to literature is that Harper Lee never found a way to tell a gothic true-crime story she’d spent years researching. Casey Cep has excavated this mesmerizing story and tells it with grace and insight and a fierce fidelity to the truth." "It’s been a long time since I picked up a book so impossible to put down. Furious Hours made me forget dinner, ignore incoming calls, and stay up reading into the small hours. It’s a work of literary and legal detection as gripping as a thriller. But it’s also a meditation on motive and mystery, the curious workings of history, hope, and ambition, justice, and the darkest matters of life and death. 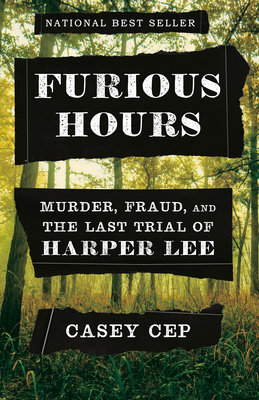 Casey Cep’s investigation into an infamous Southern murder trial and Harper Lee’s quest to write about it is a beautiful, sobering, and sometimes chilling triumph."